I know, it’s been a great long while since I’ve posted. I’ve been busy. There are never enough hours in a day to do everything I want to do, let alone NEED to do. I’ve not forgotten my passion. I wish to get back to writing, everyday. But, you know…life. In the mean time, the 3rd installment of The Bone Season is going to be getting underway, entitled The Song Rising. From today through March 6th, anyone in the US who pre-orders The Song Rising and sends us proof will receive a button and tattoo set. (See the photo below.) The full details can be found here. And honestly, who wouldn’t want to wear a rad Underqueen button? Click the image above to pre-order your copy. For those who have yet to have heard of this series, I have a treat for you. The repackaged paperbacks for The Bone Season and The Mime Order headed out into the world on February 7th. 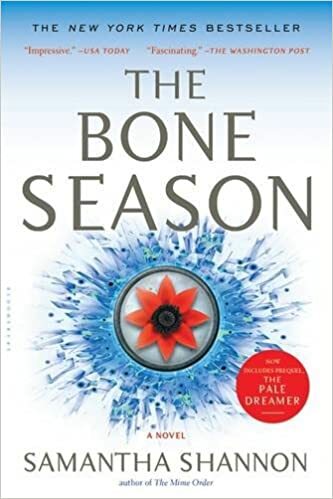 And that means I am allowed to give away, not one…but TWO copies of The Bone Season! That’s two winners that can experience Paige’s journey! Enter the world of Paige Mahoney, a gifted clairvoyant, a “dreamwalker,” in the year 2059. Her natural talents are considered treasonous under the current regime. Snatched away to a secret prison, she encounters another race, the Rephaim, creatures who wish to control the powers of Paige and those like her. One in particular will be assigned as her keeper, her trainer. But his motives are mysterious. To regain her freedom, Paige must learn to trust, in the prison where she is meant to die. Will they discover the truth of their ancient connection before it destroys them both? Ilona continues to struggle with loss, as well as trying to find where she fits in with other people, if she ever really will. She starts taking dangerous risks. 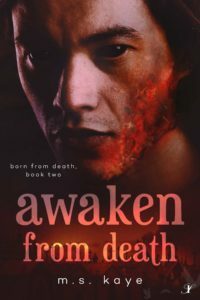 Archer is desperate to protect Illona and discovers more about himself in the progress. When Ilona is in danger of being mauled by a dog, he desperately tries something that shouldn’t be possible. And yet he succeeds. This is just the beginning of his discovery of who—what—he truly is. Release date 10/15/16 from Inkspell Publishing. Add to your to your to-read on Goodreads. Ilona discovers what it means to have a mother who is a modern woman and a father who is a 19th-century gentleman ghost. After being hit by a car and taken to the hospital, Ilona starts to realize she’s different from other people, and that her mother has hidden the truth from her. She sneaks out of the hospital in order to discover the truth. A mysterious boy named Archer guides her through Brooklyn and introduces her to Hendrick, the man who claims to be her father—though he died in 1890. 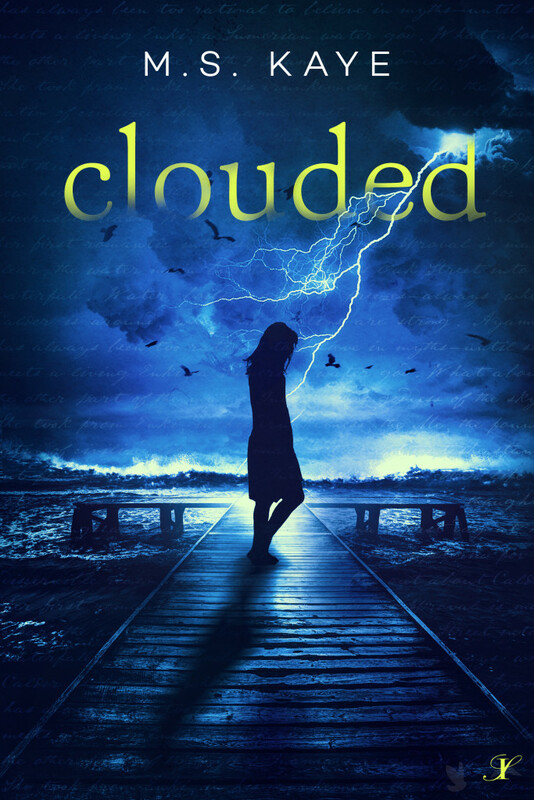 Ilona must discover not only what she must do to rid the city of Soll, a sadistic and powerful spirit, but also what it means to be half ghost. She proves what her mother told her—love is stronger than death. The blond boy didn’t walk up to a urinal or into one of the stalls, or even up to the mirror. He stood in the middle of the room. Something moved backward away from him. Out of him. She recognized Archer’s shiny black hair and strong frame even before she could see his face. She gasped. But ghosts can’t inhabit people. “I’m sorry,” Archer murmured so the boy wouldn’t hear. Lettie stared at both of them. The blond boy turned, leaned his hands on the counter, and looked at himself in the mirror…not the way people usually looked at themselves. It was more like he was trying to see something more than was in the reflection. Archer watched him, as if waiting for him to see something. A memory struck Lettie like a horse galloping across a battlefield. An ancient memory. Lettie had been around since the beginning of time on Earth, but most of those thousands of years she let slink around the crevices of her mind. It was mostly just walking the bridge with the newly deceased. There were a few memories, though, that burned into her every time she let herself pull them forward. And burned was precisely the right word. She knew—or rather, remembered—why Archer would never leave Ilona. Strong As Death – Releases Tomorrow! Release date 7/28/16 from Inkspell Publishing. Will be released 10/15/16 from Inkspell Publishing. The truth of an ancient connection threatens to destroy Ilona and Archer. As they struggle to understand, Lettie discovers, or rather remembers, their history, as well as the punishment Archer bore as a result. She comes to accept Archer will never leave Ilona, but will that cause his destruction? Another twenty yards and she’d be out of the darkness of the trees and almost to the sidewalk, within reach of the light from the streetlamps. A figure stepped out from behind a large oak, directly into Ilona’s path. Ilona stopped and searched for a way around. “What are you doing?” a rough voice growled. Ilona recognized it immediately, even before she registered Archer’s face. “It’s none of your business what I’m doing,” she said. “And I know you’ve been around,” she said. He raised his eyebrows as if she was being slow. Her lips curved a little. That was perhaps the most honest response he had yet given. She moved closer, and he backed away. He took a step back, as if in self-defense. We’re celebrating with an excerpt reading, and a giveaway! Watermark Books – Signed Copies! Celebrate HYBRID’s release with us! Hybrid is finally almost ready for release. S.P. McConnell worked magic again here. Hybrid (The Domino Project #2) is the sequel to Chameleon. It’s set in the wasteland of earth after a meteor shower causes ecological disaster, damages the atmosphere, and gives the gift of an alien parasite to the world. Book two furthers Sai, Bastian, and Dom’s journey in their fight to live free from GNW imposed rules. Without further ado – here’s a teaser of the cover by the amazingly talented S.P. McConnell. Go see the full cover at YA Interrobang! Sit back and bask in this for a moment. It’s available for pre-order for $3.99 and will be available on November 10th, 2015! t will also be available in print via CreateSpace, Amazon, but best of all, the local indie store is being really supportive and already has it available for pre-order in print there! Haven’t read Chameleon? There’s still time to catch up! When she’s not writing, she freelance edits for Chimera Editing, interns for a NYC Agency, and chases her daughter, husband, corgi, and cat. No, she doesn’t sleep. She is entirely powered by the number 2, caffeine, and beef jerky. To celebrate, we’re giving away a copy of books 1 & 2! With an Amazon e-card, and a SWAG pack! Winners will be announced on Monday October 19th! A Sumerian water and sky god myth collides with a modern high school. Ayanna is a math nerd, logical and rational, even cold, but Calder makes her feel things she never had before. Somehow, she’s able to accept it when she discovers he’s a reincarnated Sumerian water god. Will she be able to accept the full truth, that the story of Enki and Inanna has been reborn in a modern Ohio high school? “Wow! A fast-paced, science fiction delight with fabulous action, a seamless world, and the most unique characters I’ve read in a long time.” Elana Johnson, Author of the Possession Series. Taking criticism is always a delicate balance. You need to juggle what you want your story to be with what others suggest to enhance it. It’s sort of like going outside of the story in your head, and looking down on it with as fresh eyes as possible. For me, I always found it easiest if I digested the feedback for about twenty-four hours, or at least over night. Sleeping on it, always gave me a better perspective. Because, let’s face it, upon receiving even constructively critical feedback the instinctual reaction is to say: NO! It’s my story! Never! Now I’m pretty good at taking feedback. I do one of two things after processing it. 2) I go – hmmm that’s wrong, they read it wrong. So, what can I do to make sure that what I intended this section to convey comes across? Both 1 & 2 lead me to improving my story. Taking on feedback and incorporating it in my world because I know it will improve it, is a great thing. And because that world lives in my head, I know it better than anyone else. Sometimes this means that I haven’t communicated what I know in the right way and so it’s very possible (and probable) that others may misread, or just be confused. These parts also need fixing, but not necessarily changing. In a nutshell – taking criticism has become a balancing act for me. Between knowing what will make my story stronger, and what portions of my writing I need to strengthen in order to better express the book I’m aiming to put out there. When Sai’s newly awoken psionic powers accidentally destroy her apartment complex, she’s thrown into an intensive training program. Her only options are pass or die. Surviving means proving her continued existence isn’t a mistake–a task her new mentor, Bastian, takes personally. Her abilities place her in the GNW Enforcer division, and partners her with Domino 12, who is eerily human for an alien-parasite psionic hybrid. After eliminating an Exiled scientist, she discovers nothing is what it seems. With each mission more perilous, Sai must figure out who to trust before her next assignment becomes her last. If you’d like a signed physical copy, Watermark Books has them in stock. We’re having a blog hop, and an e-card & mega swag Rafflecopter giveaway! The blog hop stops are noted below. Each day has a different theme and you can find out about the process, the idea, and the evolution of Chameleon, and even a bit about K.T. by visiting each blog, when their posts go live. I’m giving away e-cards of your choice from B&N, iTunes, & Amazon – one to the value of $25, and three to the value of $10! Each prize includes a swag pack of a magnet, sticker, bookmark, postcard, and mousepad! Just follow the options listed on the giveaway and you’ll be entered! When she’s not writing, she freelance edits for Chimera Editing, interns for a NYC Agency, and chases her daughter, husband, corgis, and cat. No, she doesn’t sleep. She is entirely powered by the number 2, caffeine, and beef jerky. By far one of my favorite YA SciFi novels of all time. KT Hanna has a way of getting into the head and the heart of both her characters and her readers. Her story. Her words. Her strong plot. Her strong and diverse characters. All leave the reader feeling all the emotions and craving more. I cannot wait to read the rest of the series…and more from KT Hanna! Sai wasn’t born a leader. It was thrust upon her and she is learning how to handle that on top of learning how to control her powers. Her interactions with Bastian and Dom are strong without the need to be saved by a guy. Sai is truly a model heroine. More girls need to strive to be like her, including me. In addition to having her book on the day of its release, you’ll also get a beautiful postcard with the cover art, and a bookmark! How? Just email her a screenshot or photo of your pre-order along with your address, and she will send you a bookmark and personalized SIGNED postcard! She will run the giveaway right up until release. I hope you love her books as much as I do!! Stop by and let me know. Leave a review on Amazon, GoodReads to let her know! Spread the word! Share the love! Chameleon (The Domino Project #1) is a YA futuristic science fiction story. It’s set in the wasteland of earth after a meteor shower devastates landmasses, makes seas rise, introduces the psionic gene into the human race, damages the atmosphere, and gives the gift of an alien parasite to the world. After Sai’s newly awoken psionic power accidentally destroys her apartment complex, she’s thrown into an intensive training program. The only grades are pass or die. Surviving means proving her continued existence isn’t a mistake–a task her new mentor, Bastian, takes personally. Her abilities place her in the GNW Enforcer division, which partners her with Domino 12, who is eerily human for an alien-parasite and psionic hybrid. When her assassination duties are revealed, Sai understands the real reason for her training. On a mission to dispatch a dangerous Exiled scientist, she uncovers truths she never thought possible. Sai is unsure who to trust as her next mission might be her last, and a double agent seems to be manipulating both sides. Without further ado – here is the cover, by the amazingly talented S.P. McConnell. To celebrate, we’re giving away 2 x $10 Amazon e-gift cards (open to anyone who can receive and use an Amazon e-card) Just click on as many options as you like and enter! I’m a little late to the game because I really enjoy painting my nails and coming up with some really cool artwork for them. However, I decided to try them last month. And let me tell you, it was amazing, actually. While they don’t have a lot of my type of designs, I did find that they went on easy and lasted a long time. But most of all is my thumb nail. 10 years ago I dropped a 100 pound server on my thumb. My cuticle really. Little did I know I damaged my nail matrix. After a few years a line started forming in the center of my thumb nail. Just a few millimeters long. But as time went on, that line grew until it reached the end of my finger. My nail started splitting at that line and I could no longer grow my thumb nail long. Half my nail would grow slower than the other half and it would always split down that line. I’ve tried nail polish, nail glue, and fiberglass wraps. Nothing worked to allow them to grow again. Last test was these nail wraps. So I gave it a shot. A month later and they were still on. Very impressive. But the most impressive, they allowed me to grow and protect my thumb nail. It gave it strength. Thank you. Now, if only I can have a whole sheet of thumb nail sizes just for this purpose! PS: If any of my writer friends would like to keep up with my writing and how my life is progressing, I’ve moved over to “Caring for My Veteran“. Please subscribe there, too. Thank you. Honestly, this is such a cute little thing. I have tried my hand at something similar, though nowhere near as cute as this. I took a small water bottle, cleaned and dried. Then cut random holes in is so the kitties could get their brain exercise, their prey and puzzle solving instincts going. It didn’t look as fancy but it worked. The cats loved it so much that they ATE. EVERY. SINGLE. PIECE. I haven’t done that in a long time. And when I received this in the mail, it was quite interesting, to say the least. NOTE TO SELF: Don’t attempt to set it between 3 kitties at the same time! Of course, after I turn off my camera and leave the area, Sofie goes to town batting at it and eating all the treats. This item is that it did not come with instructions on how to open it in order to fill it, so I could see it breaking before anyone could get a chance to use it. The other thing I found was that my cats still eat it all gone in one setting. The way to combat that is not to fill it up all the way. They all love it, though. So in my book, this product is a win! Ever wonder how those fashion hair colors fade over time? Me too! 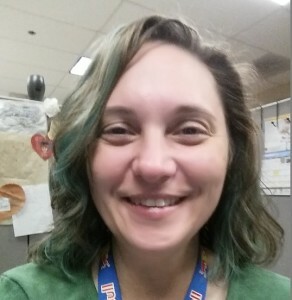 I looked at a lot of pictures before I took the plunge, trying to determine exactly how I wanted my hair. I did find a couple that I wanted. REALLY, REALLY wanted. But, they were either too radical for me and my dayjob or I just didn’t have my grey hair yet. The perfect blue. The perfect length. The perfect braid. Alas, the stylist does not want to do this one because it’s just too damaging to my hair. I love this stylist for his honesty! I’ve not had one quite like him, ever. ‘N Rage Cobalt Blue Not bad for freshly done. It really is a nice color when freshly done. Of course, I had to have her bleach the streaks first. Then she added the color. If you notice the color is not even across all strands. Some are darker than others, which is fine really. And I did not have any expectations except blue seeing as this was the first time. It was nice. But not gorgeous nice. I knew, since this was a demi-permanent color, that a little color would wash out with each wash. The very first wash had me petrified, though. So much color came out, my tub was left stained. I quickly learned, as well, that I needed to get a dark pillow case. I put a t-shirt over my pillowcase in the mean time to keep it from bleeding as I slept. Eventually that stopped after a few washes, but I still sleep with a dark pillow case, just in case. Now, the question was, how long will my blue last? Everything I read and even the bottle said, 6-8 weeks. I wash my hair every 3 days and use a sulfate free/color friendly shampoo. I think it held my color mostly well. It faded, yes. 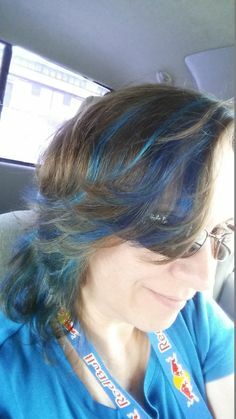 And by September, you could hardly see the teal mingling with my natural hair. By October/November, it started turning green. I was not happy with it by this time. I know, I know, you’re probably telling me that I needed to re-do it. In all honesty, I knew that was what I needed to do and I was too chicken to do it myself. Plus I didn’t want to go back to where I had it done. So, I waited. I wanted to go to my friend’s stylist but I had to get his info from her. Once I had that, then I had to wait until it wasn’t the holidays. This is my hair after 5 months. It really looks green and very faded. The end of December I had my hair consult. That’s when he told me that I shouldn’t get the all over blue because it’s too damaging. He doesn’t recommend it unless you are doing a photo shoot…no matter what color it is. 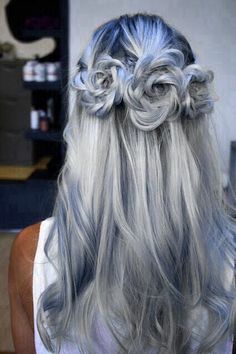 He also tried to talk me into getting purple done, only because when it fades, it turns silvery and he knew how much I wanted the silver and blue one pictured. But purple is not my color. Blue is. So blue it was. 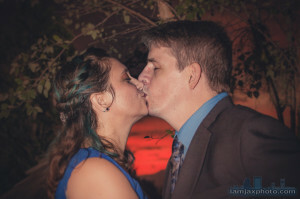 On January 2nd, he bleached more of my hair and applied a new type of blue dye. 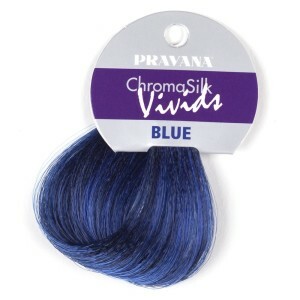 Pravana Chromasilk Vivids Blue. This time, I thought to take a picture after every washing to see how this one fades. (Should have done it the first time, too, but didn’t think about it. Oopsie.) So, below is a slideshow of my pictures after every wash. There’s no touch ups, no filters. It’s all natural and me. You can see the progression and how it fades for yourself. Hope this has helped you. It was so very hard when I was researching it myself since I couldn’t find any pictures or blogs or anything that showed me how certain brands faded. Let me know what you think. 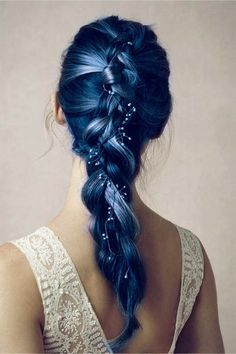 The blue hair looks really beautiful!! I received this ebook from the author for an honest review. Thank you so much. I love being introduced to new authors and stories and love the opportunity to share my opinions. While I love alternate universes and Arthurian legend, this was a bit hard for me to grasp. Some YA books are just not for me. There were copy editing errors but even big publishing houses still miss on that every now and again. The overall story was good. The plot, a few issues. I understand this to be a series so I probably don’t have everything I need to form a proper opinion. But when someone takes your fire magic abilities away from you early in the book, and then you’re practicing magic in your room only to have another person take your fire magic abilities away from you a little later…well, I scratch my head. The flow of the story was good. However, the flow of sentences I found a bit redundant. I got really frustrated when I was told A then B then C happened. When C generally follows A, B is a given. Say for instance, “I was in the shower. Then after I dried off I got dressed.” This type of telling bored me. I read Ms. Lovejoy’s CLAN and didn’t find it that way. So I am wondering if this book was meant for a younger audience? Apparently, TheoKat loves the box more than I do. I received the Influenster #FrostyVoxBox products to test and review. Everyone loves free things, right? Who could pass up on this awesome endeavor? So here’s my review of my latest box. And if you’re interested in signing up for your own, please visit Influenster and sign up today! I don’t normally wear makeup. But lately, I’ve been getting girly in my old age, I guess. With these two Vox Boxes I’ve received I’ve gotten a few bits of makeup and I’m learning. This lipstick is not overpowering, outrageous, or bold. It is nice and subtle and looks perfectly natural. What do you think? Rimmel Scandeleyes Waterproof Kohl Kajal Eyeliner In the picture above, you can also see my eyeliner. I’m learning how to put it on. I’d love to be able to do the smokey eyes, but I’ve been failing horribly with that. Though, with my limited abilities, I really like this stuff. It’s easy to glide on and stays on all day. This is definitely a nice, gentle makeup remover. However, it states that it will even remove the waterproof mascara. Well, I had the darnedest time trying to get the Covergirl Bombshell mascara I got in my last VoxBox off as well as the Rimmel Scandeleyes Waterproof Eyeliner off. After several minutes of “gently” wiping, I had the black smudged all over my eyes. I couldn’t get it off very easily at all. I would not recommend this for any black waterproof anything. But I did like it for the regular eye shadow. 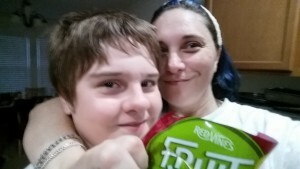 We’ve never tried the Fruit Vines Bites before and I have to tell you, I had to fight TheBoy for this! So I will definitely give this an A! 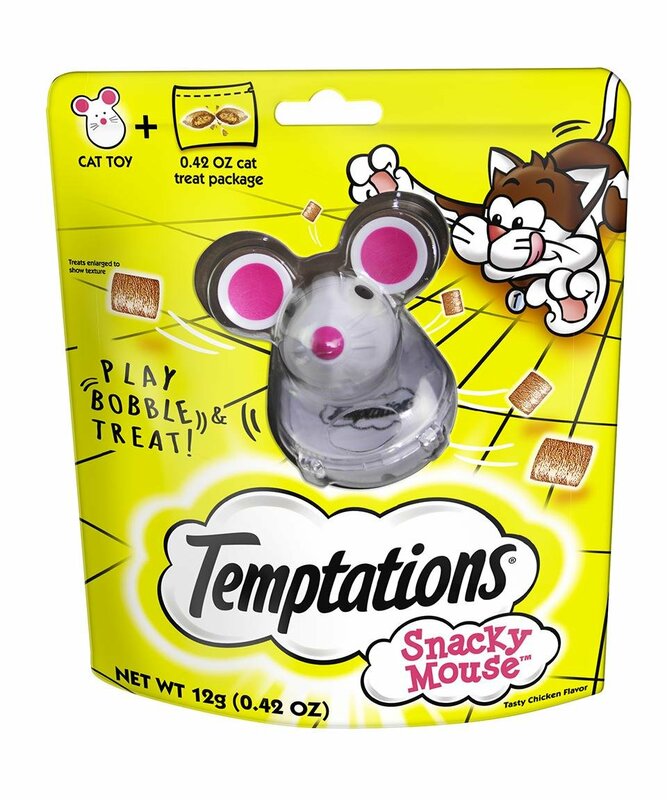 Yummy, chewy, and good! I tried this brush and it’s not for me. I like a brush that massages my scalp when I brush my hair. This will NOT get through the thickness of my hair to get to my scalp. I don’t usually blow dry my hair and I think this is for that use. It may be good for that. It’s nice and light weight and it does allow the air to pass through, so I can see that working. However, because I like that massaging scalp action, this brush has been tested on TheKats and they have now claimed it. I normally buy McCormick spices anyway. But the Gourmet Thyme. Well, that’s a first. I opened it up and the scent and the spice was much crisper than the normal McCormick spices. I used it in my TexMex Chili and just yum. Celestial Seasonings Candy Cane Lane Tea. I love tea. Always have. And green tea and mint are one of my normal teas to drink. Celestial Seasonings always has lovely seasonal teas and this one was no different. Mint has always been a good tummy soother for me. So I tried this on a day I needed it. It did not fail. The last thing I tried in this box was a sample of this Anti Aging serum. In reading the instructions, it goes to say that you will notice a difference in fine lines and wrinkles after two weeks. While I liked how I liked how it felt on my face, I did not receive enough to go the full to weeks to complete this trial and see if it lives up to its word. It was very smooth and non-oily. I wish there was a bigger sample to test. Hope you all enjoyed the quick look and review of this Influenster Vox Box as much as TheoKat and IttyBitty love the box itself! 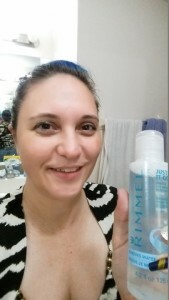 *****”I received these products complimentary from Influenster for testing purposes. 110 mySQL queries in 2.261 seconds.